Franc showroom of shoes is located in the heart of Tuscany, in the ancient town of Montespertoli, just a few kms from the wonderful city of Florence. We decided to open the showroom of shoes two years ago. Our aim was to give the opportunity to buy the shoes of Franc collections to anyone and as a reference point for anyone who wish to realize made to measure shoes. Visiting our showroom of shoes means to enter in a special place where anything is possible and where you can have this anything possible at very cheap rates, above all if the rates are compared to the quality and the services provided. Visiting our showroom of shoes means you can view, try and buy all the men's shoes and women's shoes of the ongoing collection. And, in case your size is no longer available, to make it made to measure. The possibility to ask our craftsmen to realize your own model. A designed one or a desired one.. making it on the shape of your feet. The possibily to choose the preferred leather and the preferred color from the many available in our color chart. 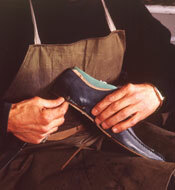 All of this with the invaluable advice of who has manufactured the shoes and worked among the shoes for over 40 years, of who is able to make anything possible because he is the craftsman who will realize it. From Monday to Saturday from 9 a.m. to 1 p.m. and from 3 p.m. to 7 p.m.